Easy recipes for canning tomato sauce at home. Use your extra garden tomatoes to make you own delicious canned tomato sauce for use all winter long. Also included is a recipe for canned Basic Tomato Sauce, and Provencal Tomato Sauce. Pack away some of the aromatic flavors when tomatoes are at their reddest and ripest by canning tomatoes into sauce or juice. It would be a shame to put out all that hard work in the garden and not have a nice thick tomato sauce to show for it! More backyard gardeners grow tomatoes than any other crop. In fact, this vegetable (technically, a fruit) may be the only plant grown by many gardeners with limited time, space, or green thumb! This is hands down the best vegetable for canning. When canned at the peak of ripeness, tomatoes are usable in many recipes which call for using fresh tomatoes. Home canned tomatoes are certainly preferred over the tough-skinned, unripe ones you see offered in the supermarket. Tomatoes can be canned whole or pureed and in other ways than "just plain". The produce can be put up with basil leaves, a seasoning of green peppers and onion, or canned with okra. The following is a traditional Provence recipe for canning tomato sauce that is absolutely out of this world! 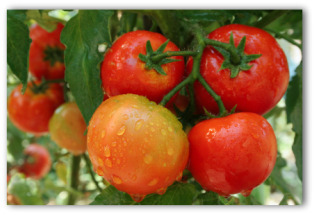 The resulting flavor of red, ripe home grown tomatoes mixed with herbs, onion, and orange cannot be duplicated in any commercially sold product. 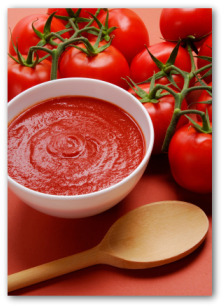 The amount of tomatoes needed depends on how thick you want your finished sauce. 35 pounds will make a thinner sauce. 45 pounds will make a thick tomato sauce. 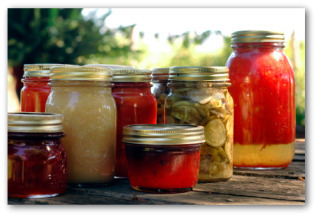 When canning tomato sauce, the lemon juice can be either fresh or bottled. Squeeze excess juice and seeds from tomatoes. Place in large container over medium heat. Simmer until volume is reduced by 1/3, or until sauce reaches desired thickness. Pack in clean hot jars. Fill to within 1/2" of top. Add 1 tablespoon bottled lemon juice concentrate to each pint. Add 2 tablespoons bottled lemon juice concentrate to each quart. Place lid and ring on jar. Process 35 minutes for pints. Process 45 minutes for quarts. This sauce goes well with any pasta or rice, boiled chicken, or beef, on hamburgers or with meat loaf. Before canning tomato sauce, gather the freshest ingredients available to you. Plunge tomatoes into boiling water for a few seconds. Then cut fruits in half and gently squeeze out the seeds and juice. There should be about 8 cups of tomato pulp. Cook slowly for about 15 minutes, covered. Do not allow onions to brown. Remove lid and stir in flour. Cook together for 3 minutes. Do not allow mixture to brown. Add the tomato pulp and all the herbs and seasonings. Add 2 tablespoons of the tomato paste. Simmer the sauce, partially covered, for 1 ½ hours. Make certain to scrape the bottom of the pot so the mixture does not scorch or stick as it thickens. While you are stirring, press the tomato pulp against the sides of the pot to make the sauce smoother. If there is any chance of scorching, add a little tomato juice or water. Cook until the tomato sauce is very thick and will stand up on a tablespoon. Remove parsley sprigs, bay leaves, and orange peel. To intensify the tomato flavor, add the remaining 2 tablespoons of tomato paste. 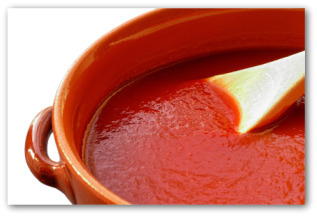 To can, spoon the cooked tomato sauce while still hot into clean, hot canning jars. Seal and process for 45 minutes in a boiling water bath. 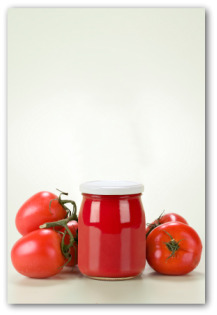 No amount of doctoring up store bought bottled or canned sauce can recapture the zest of canning tomato sauce at home.